Hand-picked and dehydrated between 45ºC and 55ºC.. 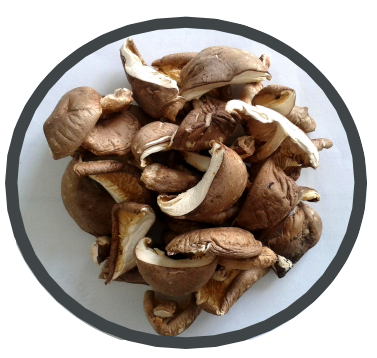 In Asian countries shiitake mushrooms have been considered a long-life symbol, thanks to their health benefits. Midzu shiitake mushrooms are produced without using beeswax. Hand-picked, rolled and dried between 40ºC and 55ºC. Suggestions for use: Soak in lukewarm water for about 30 minutes to 1 hour. After they are re-hydrated, they can be prepared like fresh mushrooms. The water can be used as a broth/bouillon for making soup or sauces. Shiitake mushrooms are delicious with risotto, sautéed, in soup or as a side dish.